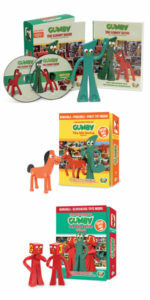 Sign Up for Gumby e-News! When you sign up for Gumby e-News, you get access to watch “Moon Trip,” Gumby’s first adventure and one of Art Clokey’s more surreal works. This is Part 1 of the pilot that started the Gumby series. Now for the first time, you can see it re-mastered (from the original source) so you can enjoy the imagination, eerie colors, dynamic action and unique story of this classic film. 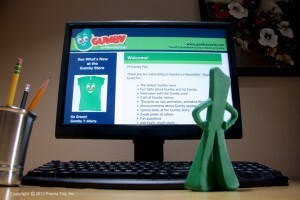 Plus, you’ll receive quarterly e-newsletters on the latest Gumby happenings and specials at our Gumby store. Sign Up Now! 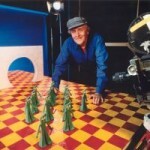 Kabillion, free on-demand cable network in the U.S.
Ameba TV streaming service, available on most devices in the U.S.
Gumby creator Art Clokey was a true visionary and stop motion pioneer whose explorations in film had a profound impact on filmmakers worldwide for generations. 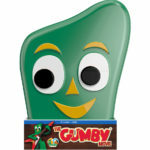 Take a spin around Gumbyworld.com to discover more about Art Clokey, Gumby and friends. Here’s a heart-warming clip from The Gumby Movie, the “Take Me Away” music video. 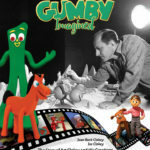 This 300-page art book about Gumby, Davey and Goliath and their creator Art Clokey is the ultimate retrospective written by the Clokey family. These micro toys are so tiny that they fit on a dime. They’re bendable and poseable, too! Your favorite bendy character is now stretchable… up to 48″! Super comfy and fun. 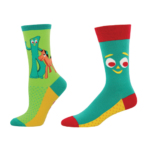 Available in two styles for men and women and in three styles for kids. Now you can have the entire 1950s and 1960s series in their remastered form – in their original lengths with original soundtracks. 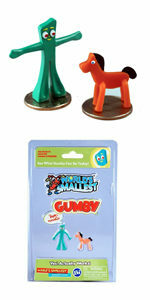 These gift sets include bendable toys and fun extras!